The pointed door in the north aisle is a fine example of the rough durable work of some village craftsman. 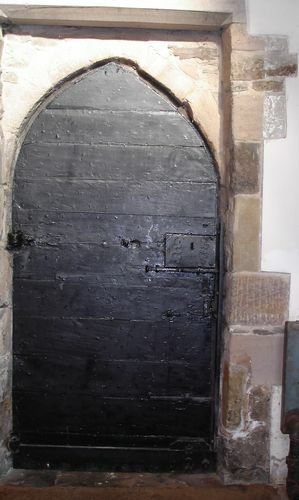 It is thought to be of 13th century date, being the original tower door, and to have been moved to its present position when the new entrance to the tower was constructed. Whilst the present door dates only from 1738, the doorway itself is of 13th century origin, attesting to the fact that an earlier church stood on this site long before the present church was completed in 1452.